While many people like to perform a large spring cleaning to say “out with the winter blues and in with the fresh air” it is also prudent to complete an autumn clean that prepares your home for winter and the upcoming holidays! 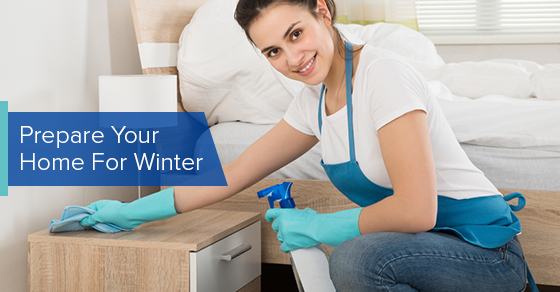 Here is a quick checklist that will allow you to be winter-ready in no time at all! Take advantage of the last of the warmer weather and clean up the exterior of your home before it’s hit with heavy rain and snow. Start by cleaning up all of your summer items including patio furniture and larger children’s toys. Be sure to give them a thorough cleaning before putting them in the appropriate storage for the winter months. Next, wipe down and cleanse all surface areas including doors, windows, trim railings, decks, and sheds. This is a great opportunity to recaulk windows, touch up chipped paint, and improve any weather stripping that requires it. Inspect and correct all eaves, downspouts, and water connections. Shut off outdoor water. Don’t pressure yourself to get the whole house cleaned in one day, take a weekend to do things properly when deep cleaning. Create a schedule to help facilitate your cleaning, starting from top to bottom. This is the time to open all the windows and let the house air out before the cold sets in. Do your heavier cleaning with the windows open to allow odours and cleaning agents to clear. Start with the upstairs. It’s a great time to change to your winter weather bedding. Launder all linens. Wash the windows, and clean the window treatments. Wipe down baseboards. Be sure to dust top to bottom and then vacuum. Why not hire or rent a steam cleaner and complete the upstairs carpets while the linens are drying? Deep clean bathrooms including disinfecting tub, toilet and sink, and removing lime and harsh buildup from faucets and shower heads. Make all the beds, including flipping mattresses end to end and upside down, and rotate your closets to feature seasonal clothing, and put away summer items. Next work on common, high-traffic rooms such as living room, dining room, kitchen, and rec room. Again, start top to bottom with dusting, wipe down all cabinets, clean windows and window treatments, and deep clean all appliances and upholsteries. Wipe down baseboards and light switches, and inspect all appliances including the furnace to make sure they are in good working order. Replace or book technicians for those that are not. Remember to change furnace filters, clean lint traps, and inspect humidifiers before the heating season begins.